The Royal Army of Oman (RAO), represented by the Musandam Security Force and the Sultan of Oman Parachutes (SOP), executed the Omani-British joint exercise (Mountain Storm) with the participation of British Royal Army units under the patronage of Major General Matar bin Salem al Balushi, RAO Commander. The joint training exercise took place at RAO the Mountain Areas Combat Training Unit in the Governorate of Musandam, where the Omani-British participating forces carried out the desired plans, in order to achieve the training objectives envisaged by the exercise activities, during which the participants showed a high level of performance and spirit. The implementation of such exercises comes within the framework of the RAO training plan to maintain the high level of performance, training and combat efficiency among RAO personnel, as well as within the annual programs implemented by the RAO with the friendly countries. 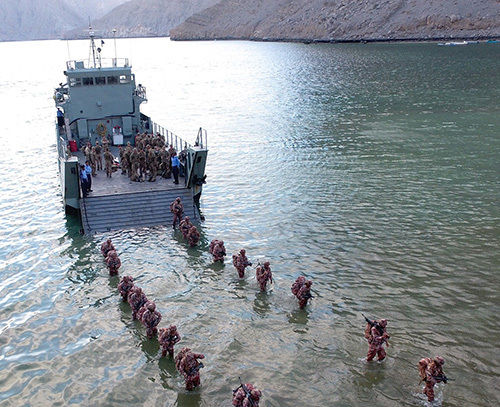 The joint Omani-British exercise was attended by Brigadier Naseer bin Nasser al-Jamoudi, Commander of the Musandam Sector, Brigadier Simon Graham of the Royal British Forces, and a number of senior officers and officers from both sides, according to Oman News Agency (ONA). Meanwhile, Gavin Williamson, British Defence Secretary, and his accompanying delegation, arrived to Muscat Wednesday on an official several-day visit to the Sultanate. The guest was received at Muscat International Airport by Brigadier Saleh bin Ahmed al-Hinai, Head of the Military Protocols and Public Relations at COSAF, the British Ambassador to the Sultanate and the Military Attaché at the British Embassy in Muscat.